13 Nights accommodation at the hotel mentioned above or similar category of alternate hotels. Meal Plan – CP– Daily buffet Breakfast at all the hotels. 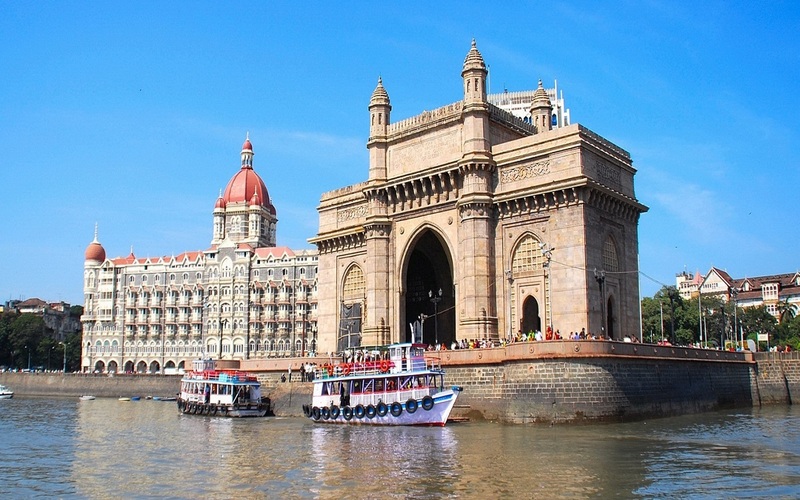 All land transportation using a private air-conditioned chauffeured Toyota Innova Car with All India Tourist Permit exactly as per the above itinerary. 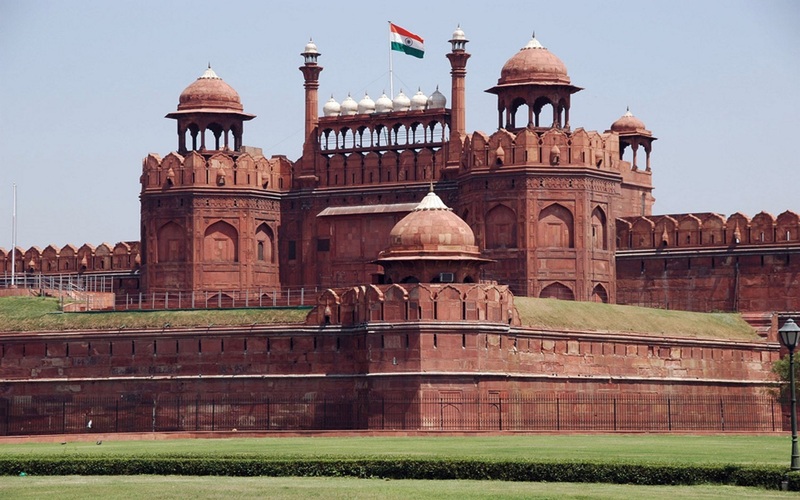 Delhi, full day city tour of Old and New Delhi + Rickshaw Ride. Agra, half day city tour + Tonga Ride + Visit to Fatehpur Sikri + Visit to Mathura + Visit to Sikandra. 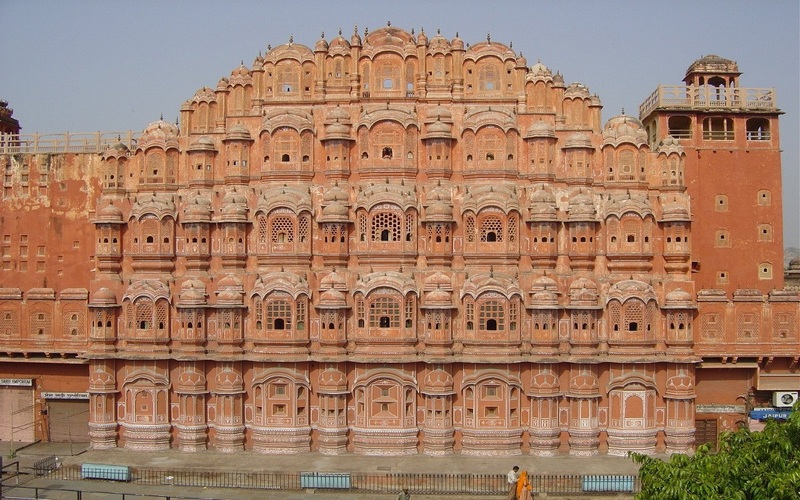 Jaipur, full day city tour + Elephant Ride at Amber Fort + Tuk Tuk Ride. Jodhpur, half day city tour. Jaisalmer, half day city tour + O1 Camel ride on Sand dunes at Sunset. Udaipur, half day city Tour + Visit to Ranakpur + Common Boat ride on Lake Pichola. Representative for assistance on arrival and departure transfers. 1 litre Mineral water per pax per day. Dinner at Narain Niwas Palace in Jaipur. Lunch at Fatehbagh in Ranakpur. Flight Udaipur to Delhi Tourist class. All currently applicable taxes including service tax. Road taxes, parking fee, fuel charges, interstate taxes. Any other services not mentioned in the inclusions. Any expenses caused by reasons beyond our control such as road blocks, accidents & any medical evacuations. Any train delays, or re-scheduling etc. Any Visa fees, insurance fees, etc. Any tips to hotel staff, local guides, drivers etc. Any meals apart from the ones mentioned above. Any expenses apart from the ones above. Arrive Delhi International Airport and you will be transferred to your hotel. India’s capital and a major gateway to the country, contemporary Delhi is a bustling metropolis, which successfully combines in its folds - the ancient with the modern. Amidst the fast spiraling skyscrapers, the remnants of a bygone time in the form of its many monuments stand as silent reminders to the region’s ancient legacy. The first impressions for any visitor traveling in from the airport are of a spacious, garden city, tree-lined with a number of beautiful parks. After breakfast proceed for half day panoramic tour of New Delhi. Delhi – visit Qutub Minar, in 1199 AD, Qutubuddin erected the Qtub Minar either as a victory tower or as a minaret of the adjacent mosque. Form base of 14.32 meters, it tapers to 2.75 meters, at the height of 72.5 meters. Humayun’s Tomb, a mausoleum of the Mughal emperor Humayun; Later drive past the Presidential House, Parliament house, Government buildings and India Gate. Later visit Old Delhi - the former center of Mughal power which offers ancient monuments, narrow streets, and bustling markets; Your sightseeing includes a visit to Red Fort which was built in 1648 by the Mughal Emperor Shah Jahan famous for his great edifice of love the Taj Mahal. Jama Masjid, the biggest mosque in India. Also, visit the Sikh temple – Bangla Saheb Gurudwara and Lotus Temple. After breakfast drive to Agra en route visiting Mathura. Mathura widely known as the birthplace of Lord Krishna is located on the western bank of river Yamuna. It is 145 km southeast of Delhi and 58 Km North West of Agra in UP. The great school of sculpture known as Mathura school of Art flourished here for 1200 Years. A survey of this glorious School of Art can be made in the Government Museum, Mathura. The present-day Mathura abounds in Place of Religious and Historic Interest, All around the year A large number of Festival and fairs are held in Matura and adjoining areas of Vrindavan, Gokul, Brazen, and Goverdhan. Later continue your drive to Agra en route visiting Sikandra. The sandstone and marble tomb of Akbar, the greatest of the Mughal emperors, lies in a peaceful garden 4 km north west of Agra. Its construction was begun by Akbar himself but completed by his son Jahangir in 1613. The southern gateway, the most impressive part of the complex, is made of red sandstone inlaid with abstract patterns in white marble. The tomb itself has four stories, three of red sandstone and the fourth of marble. True to Akbar’s philosophy of a single unifying religion, his tomb shows a blend of motifs and styles of various religions. 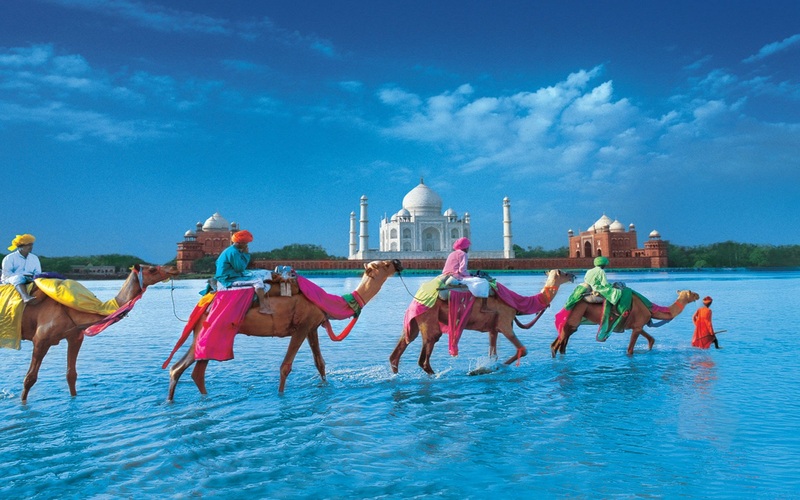 Later Arrive Agra and transfer to your hotel. Agra came into limelight during the rule of Afghan King Sikandar Lodhi - who had made it the capital of his empire. Later in 1526 A.D., the Mughal Emperor Babar took upon himself the task of rendering Agra, a unique character, and beauty of its own. Agra - in terms of ambiance is still associated with its Mughal period. The Mughals besides being great rulers were also great builders and they preserved their best architectural wonders for Agra & its neighborhood. It has many wonderful monuments and the Taj Mahal, the greatest of them all, is a masterpiece of Mughal architecture at its best. 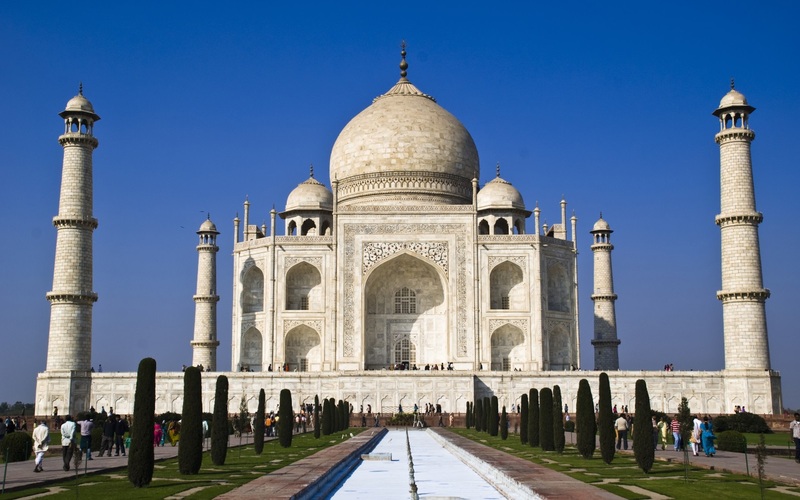 After breakfast proceed for half day city tour of Agra the Taj Mahal (closed on Friday) - The Taj Mahal is everything that has been said about it and more. Built by the Mughal Emperor Shah Jahan as an expression of his love for his wife Mumtaz Mahal, in mid 17th century, the Taj Mahal is truly one of the wonders of the world. Though the Taj appears to be amazingly perfect from almost any angle, it is the close-up marble inlay work, which is really astounding. Later visit The Agra Fort, an outstanding example of Mughal architecture. Agra Fort - the seat and the stronghold of the Mughal Empire under successive generations. This was the seat of Mughal rule. Shahjahan added the impressive quarters and the mosque while Aurangzeb added the outer ramparts. Visit its Hall of Public Audience and its Royal Pavilions. Besides the historical monuments, one can also explore Agra’s rich heritage of handicrafts in its markets. Also visit Mother Teresa and Itmad ud Daula -This tomb was built in 1622 for Ghiyas Beg, father of Empress Noor-Jahan, the wife of Emperor Jahangir. It is beautifully conceived in white marble, mosaic and lattice and set a precedent as the first Mughal building to be faced with white marble inlaid with contrasting stones. Sometimes also called ‘Baby Taj’, it is small, intimate and has a gentle serenity. After breakfast drive to Jaipur en route visit Fatehpur Sikri - the deserted red sandstone city was built by the Great Mughal Emperor, Akbar, as his capital and palace in the late 16th century. It was abandoned soon after it was built when the local wells went dry and it remains today in much the same condition that it was over 300 years ago. It is complete with palaces and mosques and used to be a town larger than London when it was originally constructed. Now it is an extraordinary place to wander around with its buildings in near perfect condition. Later continue to drive to Jaipur. Arrive Jaipur and transfer to your hotel. Jaipur - The capital of Rajasthan Jaipur - popularly known as the “Pink City “as the Pink sandstone was used to construct the buildings in the Old walled city. Jaipur (City of Victory) was founded by Maharaja Sawai Jai Singh II in 1727. It is the only city in the world symbolizing the nine divisions of the Universe through nine rectangular sectors sub-dividing it. The architect who formalized the city’s plans on the Shilpa Shastra, the epic Hindu treatise on architecture, mixed it with the sublimity of the Mughal and Jain influences of those times. The city was painted pink in 1853 in honor of the visit by Prince Albert. Except for the busy traffic of bicycles, cars, and buses, little seems to have changed. Aarti ceremony at Templo of Birla and dinner-show at Narain Niwas Palace. After breakfast proceed for the city tour of Jaipur – visiting Amer Fort of the Kachhwaha clan of Amber, which used to be the capital until it was moved to Jaipur. An elephant (Subject to availability/alternatively by jeep) will spare you the trouble of reaching up to the fortress. Once on top, stroll through the sprawling complex of courtyards and halls; Also visit Gaitore Cenotaphs Cremation place of the Jaipur royal family since the time of Maharaja Sawai Jai Singh. Later visit the City of Jaipur. Among the highlights to be seen while touring Jaipur include the City Palace. The palace museum houses collections of rare manuscripts, armor, costumes, carpets and miniature paintings. Walk to the adjacent Jantar Mantar or Astronomical Observatory made by the Maharaja of Jaipur, built in 1726 and is one of the five such astronomical wonders built by Sawai Jai Singh and make s accurate predictions even to this day. You will also have the opportunity to wander about the local markets. After breakfast drive to Jodhpur. Arrive at the Blue City – Jodhpur and transfer to your hotel. An oasis in the arid Thar Desert, Jodhpur is the second largest city in the state of Rajasthan. Representing this colorful city with shades of blue, Jodhpur has a history that is rich and a present that beckons strongly to the discerning tourist. Forts and palaces, temples and havelis, culture and tradition, spices and fabrics, color and texture, Jodhpur have them all and in plenty. Situated in Western Rajasthan, Jodhpur has long attracted both the domestic and outside tourist.It not only offers tangibles, in terms of what you can see and buy but also fills one with a sense of history and the splendors of an era gone by. The hospitality of the locals, the demure women, and the colorful turbans -all set against the beloved desert (Marwar) is something to feel, not just see. Every pore of Jodhpur tells its own tales of heroic deeds that made legends out of kings and soldiers, romances that continue to warm the heart and a time when epics were lived out on the streets by everyday man. After breakfast drive to Jaisalmer. Arrive Jaisalmer and transfer to your hotel. Jaisalmer - a fairy-tale town in the Thar Desert founded about 800 years ago by Jaisal. Unlike any other city, this desert fortress is one of Rajasthan's most exotic and unusual towns. Jaisalmer, an important ancient trading center because of its strategic location on the camel trade routes, is often described as the 'golden city'. The havelis, built by merchants of the 19th century, are exquisitely carved from golden-yellow sandstone and are still in a beautiful condition. The fort built by Rawal Jaisal in the 12th century stands on the 80-meter high Trikuta hill, with beautifully carved Jain temples. The annual desert festival takes place in January and February each year and is a riot of color and activity. Jaisalmer is also famous for its embroidery, Rajasthani mirror work, rugs, and blankets, antique, silver jewelry, stonework, and camel safaris. After breakfast leave for the city tour of Jaisalmer. Visit the famous Havelis (mansions) known for their frescoes. Jaisalmer's strategic position on the camel terrain route bought it great wealth. The merchants grew prosperous and commissioned great havelis, or mansions, to flaunt their ever-growing status in society. Made of local golden-yellow sandstone and wood, some of the havelis are still in excellent condition. The most elaborate and magnificent of all the Jaisalmer havelis is the Patwaon Ki Haveli. Five Jain brothers built the Haveli between 1800 and 1860. Salim Singh Ki Haveli and Nathmal Ki Haveli are the other two havelis that are opened to visitors. Built-in 1156 by the Bhatti ruler, Jaisal, THE FORT here stands atop the 80 m high Trikuta hill. 3 walls and features 99 bastions surround the fort. Over the centuries, the golden sandstone fortress witnessed many battles between the Bhatti Rajputs, the Mughals and the authors of Jodhpur. Within the fort, complex lie the beautifully carved Jain Temples built between the 12th and 15th centuries. The Maharawals (rulers) of Jaisalmer were devout Hindus but were tolerant of Jainism, and encouraged art and religion. There are 7 temples in the complex - Chandraprabhu, Parasnath, Shitalnath, Sambhavnath, Shantinath, Kunthunath and Rikhabdev Temple. The temples are all connected by a series of corridors and walkways. Close by is the Gyan Bhandar, a library founded in 1500 A.D. This house is priceless ancient manuscripts and other exhibits like astrological charts, besides the Jain equivalent of the Christian Shroud of Turin. Evening enjoys the sunset with Camel Ride. Overnight at Hotel. After breakfast drive to Jodhpur. Arrive Jodhpur and transfer to your hotel. Later visit the Meherangarh Fort. Considered one of India's best forts, this invincible stronghold of Marwar sits on a steep hill lording over a wonderful view of its surroundings. It is also a beautiful fort and undoubtedly, the jewel of Jodhpur. Intricate latticed windows, elaborately carved panels, and elegantly curved porches speak of beauty and taste. No matter what part of the fort you are in, its ambiance will leave you in awe and your senses reeling. Take in the sight high up on the rampart where the second largest cannon in Asia rests. Also, visit Jaswant Thada - a white marble memorial built in memory of Maharaja Jaswant II in 1899. Today after breakfast visit the local market areas by doing a walking tour of Jodhpur city. Optional – Half day Bishnoi Village tour. Lunch and later continue to drive to Udaipur, arrive Udaipur and transfer to your hotel. Set on the shores of Lake Pichola and surrounded by hills, Udaipur grew in complete contrast to the harsh deserts of the rest of Rajasthan. As the capital of the old Mewar State, it was the only Rajput stronghold to uphold its Hindu allegiance in the face of Muslim invasion. Set on the shores of Lake Pichola and surrounded by hills, Udaipur grew in complete contrast to the harsh deserts of the rest of Rajasthan. As the capital of the old Mewar State, it was the only Rajput stronghold to uphold its Hindu allegiance in the face of Muslim invasion. After breakfast proceeds for half day city tour of Udaipur – visiting the City Palace and Museum. 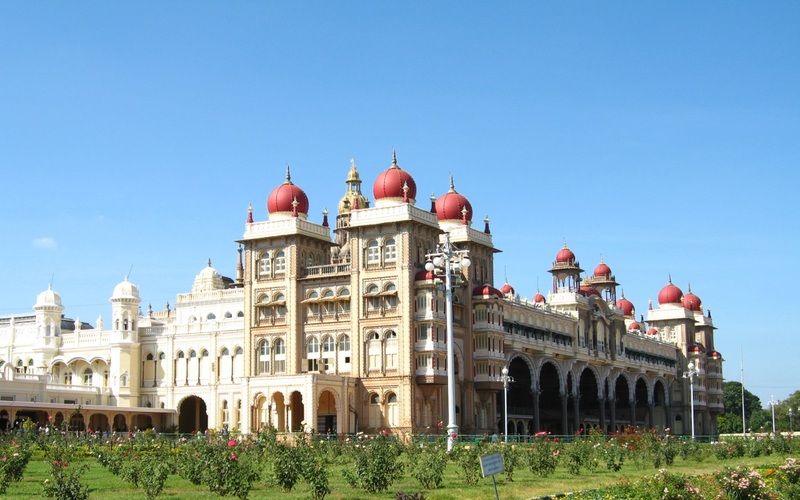 The largest palace complex in India, it is a blend of Mughal and Rajput influences. Also, see the 17th century Jagdish temple, drive around the Fatehsagar Lake, and visit the Sahelion ki Bari (the Garden for the Maids of Honour), an ornamental pleasure garden with fountains and marble kiosks. 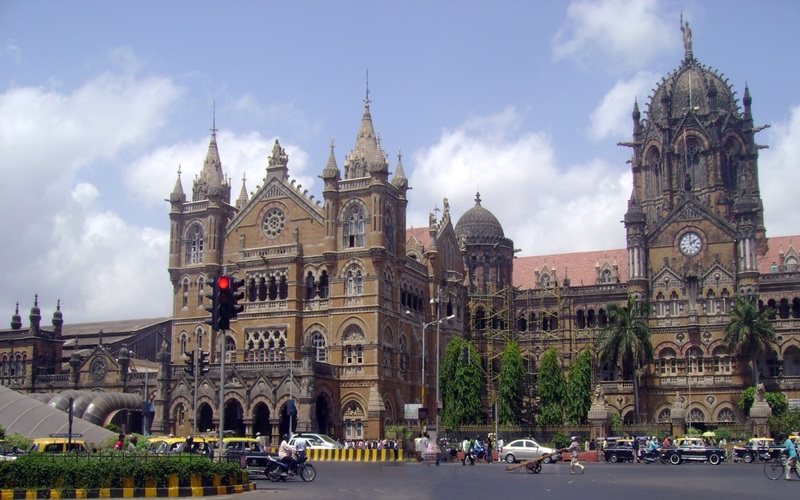 Later visit the Bharatiya Lok Kala Mandir or the Folk Art Museum. Evening proceeds for a Common boat ride on Lake Pichola. Today in time transfer to Udaipur Airport to board your flight for Delhi. Arrive Delhi and internally transfer to International Departure terminal to board your flight for onward destination. Red Fort in Delhi is closed on Monday. Taj Mahal in Agra is closed on Friday. Hawa Mahal in Jaipur is closed on Friday. Elephant ride in Jaipur is purely subject to availability. Check-In time is 1400 hrs & Check-out time 1200 noon at all hotels. THE ABOVE RATE IS NOT VALID DURING THE DIWALI PERIODS, PUSHKAR FAIR AND X- MAS & NEW YEAR PERIODS. In case of any amendment in local Government taxes, or any fuel hike, we reserve the right to adjust the tour price accordingly. The names of hotels mentioned above only indicate that our rates have been based on usage of these hotels. It is not to be construed that accommodation is confirmed at these hotels until and unless we convey the confirmations to you on receipt of your acceptance. In the event of any of the above-mentioned hotels not becoming available at the time of initiating the reservations, we shall book alternate accommodation at a similar or next best available hotel and shall pass on the difference of rates (supplement/reduction whatever applicable) to you. Prices are quoted in US Dollars per person per trip and valid till Oct. 30.2018, except during Christmas, New Year & Easter holidays. 0- 01.99 Free of Charge. 2 - 05.99 pay 25% of tour price. 6 - 11.99 pay 50% of tour price. 15% of full payment will be required when confirming your booking and the rest of the payment will be paid, when arriving to Egypt, by credit or debit card. After your tour is confirmed we will email the final confirmation and a voucher to print and bring with you. Cali4Travel does not charge a cancellation fee for tours and excursions cancelled for ‘force majeure’ reasons such as volcanoes, earthquakes, or reasons beyond control. If cancellation happens due to personal or business reasons and Cali4Travel has already paid costs on your behalf, you will charged for these costs. World's leading tour and travels Booking website,Over 30,000 packages worldwide.